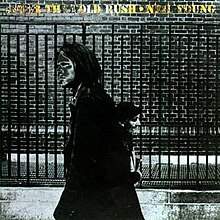 NEIL YOUNG: AFTER THE GOLD RUSH: 1970: 5 STARS OUT OF 5 STARS: Neil’s third album and it remains one of his best. Great album cover, great songs. It initially received mixed reviews but is now viewed as a classic. The title song is one of my favorite Neil songs Southern Man, I Believe In You, Birds, Don’t Let It Bring You Down. Only Love Can Break Your Heart came close to a hit at #33. I have to laugh at the original review in Rolling Stone “none of the songs here rise about the uniformly dull surface.” I am sure Langdon Winner would love to have those words back. DAVID BOWIE: BACKSTAR: 2016: 5 STARS OUT OF 5 STARS: Leave it to David Bowie to release an innovative final album just hours before his passing. One of those albums I continue to hear new things on repeated listenings. It was good to see Bowie make a comeback with two albums in the last years of his life after many years of silence. Blackstar is probably Bowie’s most underrated album, at this point. I think it will grow in stature as years go by. Langdon Winner (who received his Ph.D. back in 1973, three years after penning his now retrospectively off-the-mark review of Neil Young’s AFTER THE GOLD RUSH album) is now 74 years of age and the chair of f Humanities and Social Sciences in the Department of Science and Technology Studies at Rensselaer Polytechnic Institute, Troy, New York. I guess it shows you can definitely recover from what might now decades later be considered a ‘gaff’ and go on to achieve great success in one’s chosen field. Glad to see he’s recovered. I hadn’t seen that name in years as far as rock journalism goes… I wonder what is the all time greatest review gaff? Geoff Barton is a respected music critic and wrote for Sounds in the 1970s. It might have been him who broke Rush in the UK. He wrote that Starcastle’s Real to Reel was an excellent album. It’s not. It possibly also has one of the worst album covers in Prog Rock history. I remember The Rolling Stone Record Guide- giving Neil’s Rust Never Sleeps a 2 star rating- it’s my favorite. I remember thinking the 2 star was startling. Not sure who the critic was. I saw the original of the Neil Young cover shot. Graham Nash was behind Neil and closer to the camera. He got cropped out. Bowie is an interesting figure- seems like critics are divided on him or were.